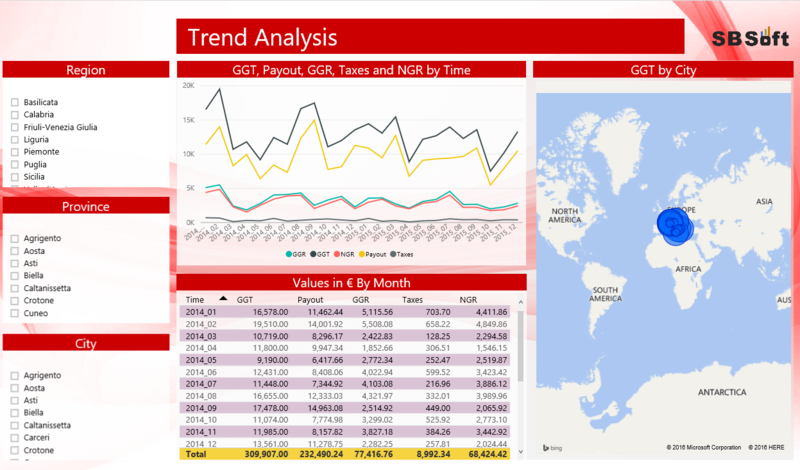 “Power Gambling” is a PowerBI tool designed for betting and gambling industries. Statistics on games played, wins, taxes and incomes. Monitor the trend of games played and keep under control taxes, income and many other situations, is crucial in Gambling industries. 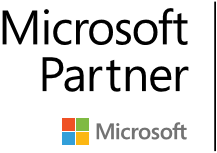 About this, we provide a must-have tool that helps users to do all of this and more, quickly and easily. Executive Summary simply shows the main data by Balance Entry (like Total Euros, Type of Game and Year's Comparison). In the boxes on the left, it is possible to filter data by the time dimension and select multiple fields to visualize different Years, Quarters, Months or Days and then compare data. 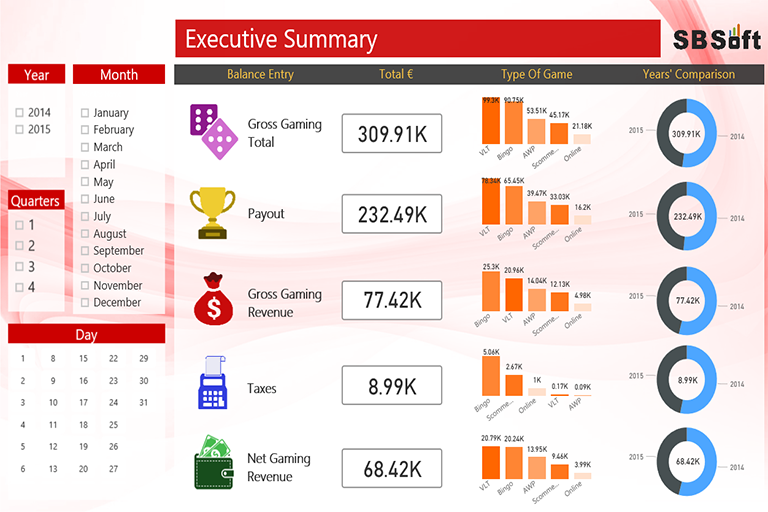 The Trend Analysis Report contains some very intuitive charts that help to monitor the Gross Gaming Total, Payout, Gross Gaming Revenue, Taxes and Net Gaming Revenue by Time. A visual map shows the Gross Gaming total by City and the Table below contains the Values in Euros by Months; all of that can be filtered by Region, Province or City. Focus on VLT Report refers only to the Video lottery game type. The waterfall chart splits the Gross Gaming Total by Game Room Category. The table below shows the data by single VLT Room. On the left, the Pareto Analysis mixes a bar chart with a line chart where bars show a descendent Gross Gaming total from the highest to the lowest value by Video lottery Game Room and the line displays the percentage of progressive total. 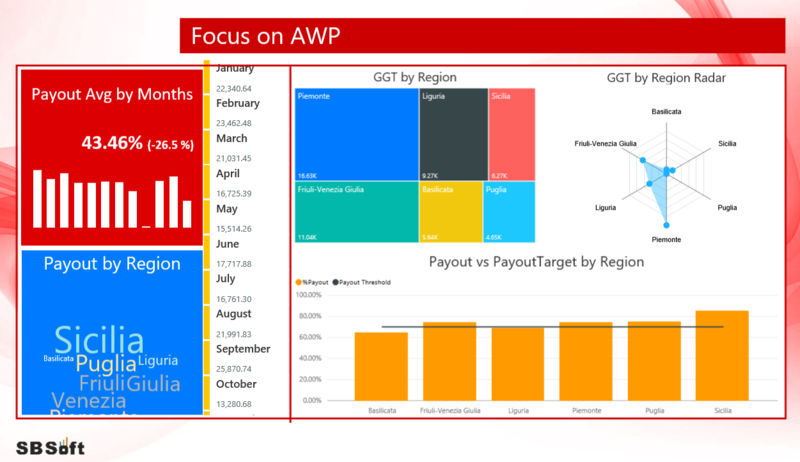 In the Focus on AWP (also known as “New Slot”), the KPI on the left gives an insight of the payout average by month. The KPI compares the actual payout percentage with the payout threshold (in our case it is 70%). Between brackets it is specified the gap with the target value. Red, yellow or green color, help to understand if the correct payout percentage is reached or not.The Word Cloud chart underlines the difference of all AWP Regions' payouts: bigger is the name of the Region, bigger is the payout Percentage. The Area Chart lets to analyze Gross Gaming Total values by Region. The Radar Chart shows the Net Gaming Revenue by region, while the combined chart compares all regions payout, that are represented with bars, and Payout Threshold represented with the line. Click once on a bar to drill down to Province level and twice to drill down to City level. To drill-up click the up-arrow key on the top of the chart.